Tilly Mint is a semi-custom, handcrafted 67ft sailboat built in England by Discovery Yachts – a boatyard renowned for innovative and award winning sailboats. She is the largest model offered by Discovery, and like her little sister the Discovery 55’, she was designed by the most prominent naval architect of this century, Ron Holland. 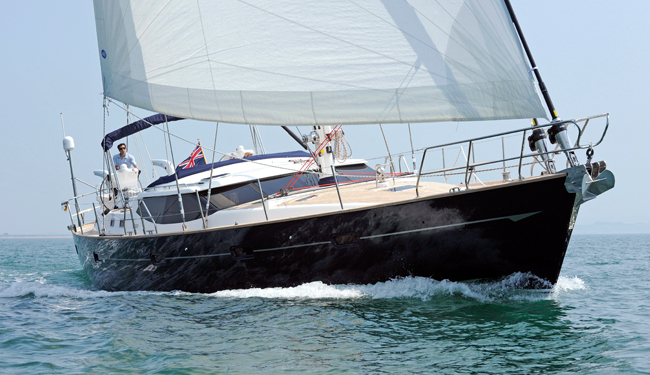 Since being launched in 2009, Tilly Mint has been lightly used by her private owner. She is now being offered for charter in the Caribbean and the Mediterranean. Tilly Mint sleeps 7 in 3 cabins: The master cabin is aft with a queen walk-around bed, ensuite bath with glass shower enclosure and ‘power shower’ plus a large TV, DVD and IPOD connection. Two guest cabins are located forward. The walk-around queen cabin has a large TV, DVD and IPOD connection. The door to this cabin can be moved to make the luxury bathroom either ensuite or shared with the portside guest cabin which has a large lower double bed and a single pullman bunk, plus a small TV and DVD player and an IPOD connection.